Eden Hazard and Gonzalo Higuain both scored twice as Chelsea thumped Huddersfield. Here’s how we rated each Blues player in the 5-0 win at Stamford Bridge. A easy day’s graft for the Spaniard, who barely had a shot to save. He was impressive in defence, making a couple of crucial interceptions, and effective in attack. Azpilicueta won the penalty with a surging run, went close with a rasping long-range shot and was always available to support in the final third. A powerful header capped a rock-solid performance by Luiz, whose presence and influence is crucial if not always appreciated. Luiz was wonderful in possession and always likely to set up a chance with an incisive pass out of defence. The pressure was on for the Dane, who replaced the popular figure of Antonio Rudiger in defence, and he responded impressively with a solid display. He read the game supremely well, never panicked in possession and showed the vital ability to bring the ball out of defence and set Chelsea on the attack. Steady on his return to the side, but understandably a little tentative in attack having had his confidence knocked by some indifferent showings. He was quietly efficient that was the platform for a dominant win, although the Italy international will not get much credit for an unspectacular performance. He looked to find a killer pass more, no doubt because of the presence and threat of Higuain up front. The man of the match, despite both Higuain and Eden Hazard grabbing two goals. Having Higuain up front meant Kante was able to arrive later in the box and run from deep rather than be a slightly confused auxiliary forward. It meant he caused havoc as a result, making numerous attacking runs and setting up many a chance. His pass for the first goal was sublime and he was involved in the third and fourth. Combined tenacity with the work-rate throughout, with plenty of unselfish off-the-ball work and some fabulous passing – notably his assist for Hazard’s second goal. The Brazilian so nearly scored with a trademark quick shift inside and strike towards the far corner after the break and played his part in a fine team victory. His delivery for the Luiz header was spot on and he also involved in the slick passing move for Higuain’s opening goal. Majestic at times and looks so much happier with a target man to play off and the chance to drop deep whenever he felt like it. He affected play throughout, struck his penalty with total confidence and added a stylish second before leaving the pitch to a standing ovation. 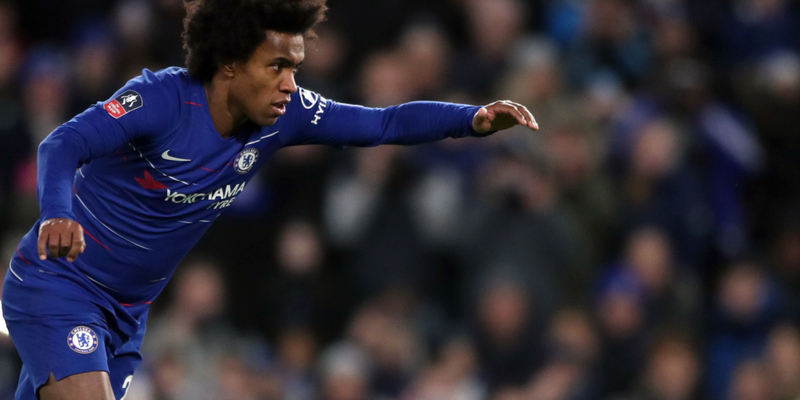 His first-time finish from distance for his second goal was glorious and his off-the-ball-running and ability to create space for others a huge boost to Kante, Hazard and Willian in particular. His first goal in a Chelsea shirt was also brilliantly taken and he grew in confidence from then. Higuain could easily have had a hat-trick, going close with a half-volley and a near-post strike. The Argentine looked sharper as the game wore on after a slightly rusty opening quarter of an hour. Neat and tidy in the closing stages without making a significant impact in a match that was already won. He didn’t make the most of a couple of decent opportunities to run at a demoralised and defeated defence late on but showed glimpses of his frightening pace and dribbling ability and continues to play with refreshing freedom.